A traitor to his children's future? 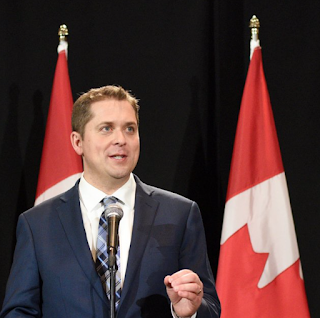 Canada's Conservative Party just chose a new leader — one who doesn't understand climate change any better than the old one did. 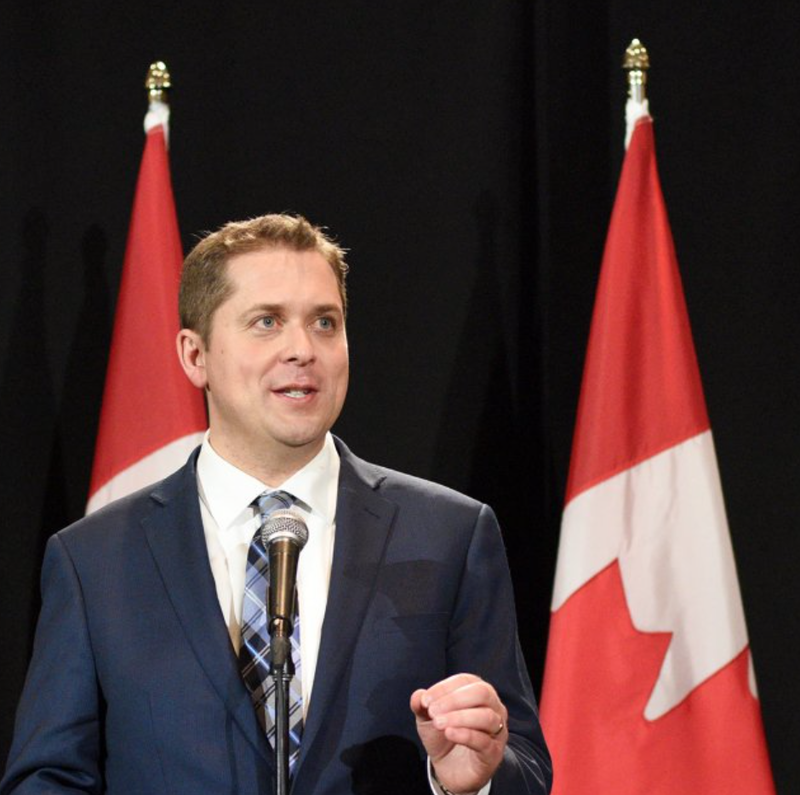 I'm appalled that in 2017, in the midst of the sixth mass extinction and climate change chaos around the world, when they could have elected Michael Chong to be their leader, they chose Andrew Scheer, who doesn't seem to give a flying leap about his children's future. So, you think this is not an emergency? You think this is only an important issue to Ms Leslie? 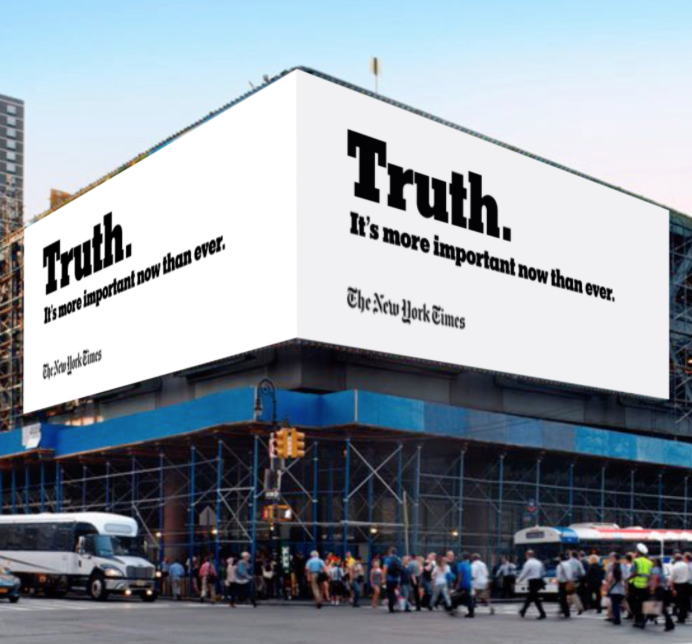 You don't KNOW that the meltdown of the Arctic sea ice in the summer has EVERYTHING to do with the welfare and survival of your four children, Thomas, Grace, Madeline, and Henry? As I read on the Parliament of Canada website, "It is the Speaker's duty to interpret these rules impartially, to maintain order, and to defend the rights and privileges of Members, including the right to freedom of speech. To preserve the trust of the House, the Speaker's actions must be impartial." I don't think you defended the right of our MPs to contribute to (and to enjoy) a safe future, nor do I think your action was impartial. I beseech you to drop the Conservative party line (climate change? what climate change? emergency? we only see $$) in order to give your kids -- and all the children, of all species -- a chance at a future. I know that because of your postsecondary education, you have a grasp of history and politics. And your experience in the insurance industry should help you understand the climate change emergency: "Climate change is a subject that concerns us all. It is one of the greatest risks facing mankind [sic]. In recent years, Munich Re has actively supported and advanced climate protection and adaptation to global warming." (from the website of Munich Re, one of the world's largest re-insurers. "Research indicates river flows in some parts of the prairies have declined by 40 percent over the past 75 years. River flow in the late summer and fall is largely dependent on glacial melt. Much of the spring and early summer flow results from runoff from winter snows in the mountains and precipitation throughout the river basin. Evidence is that snowfall, both in the mountains and elsewhere in the basin, has decreased in the last 100 years. Summer precipitation is up slightly in the Prairies, but rates of evaporation due to higher temperatures tend to neutralize that increase. "Climate change predictions show an average temperature increase of 3°-5°C in the southern Prairies by mid-century. Research indicates that an increase of just 1°C in mean annual temperatures can reduce stream flows by as much as 15 percent." "Overwhelming evidence indicates the climate of the Prairie Provinces is warming and drying, resulting in decreased river flows. If climate change continues to accelerate as predicted, water will be in short supply for municipalities, industry and recreational users in the coming decades. "Saskatoon is just one of many water users spread throughout a river basin that runs across three provinces. Even Regina, which is not located in the Saskatchewan River basin, relies on water diverted from Lake Diefenbaker on the South Saskatchewan." But here's the scariest part of your decision. The summer Arctic sea ice serves as the air conditioning for the growing season of the northern hemisphere. Did you notice any heat waves or drought conditions in North American this summer? Did you notice the 2.5 million people impacted by summer flooding in Pakistan in 2010? Did you hear about the wild fires and crop failures in Russia that same summer? Wild fires that killed thousands (especially due to the carbon monoxide in the smoke) and crop failures that closed down Russia's grain exports and helped spark the Arab Spring due to high food prices? We NEED a frozen Arctic in the summer, Mr. Speaker. We are now more than 7 billion human beings who evolved over the last 10,000 years to be dependent on agriculture, and agriculture is dependent on a stable climate. Not only do we lose our climate stability if we lose the Arctic summer sea ice, but that loss is also triggering further warming due to loss of the albedo effect, creating a vicious circle of carbon feedbacks that will soon – if unchecked – become unstoppable. Although it is not easy to picture our children at our age – and even harder to picture them living lives marked by food and water shortages, droughts and floods, famines and thirst, horrifying heat waves, and extreme weather events – THAT is the life you are contributing to for your children by not allowing Canada to move forward on treating the Arctic meltdown as an emergency. And that is not to mention the hundreds of thousands of those more vulnerable to climate disruption and climate chaos who have already lost their lives or their loved ones, their livelihoods, their food security and water sources, their homes or entire homelands. Please, please, please reconsider your decision, Mr. Speaker. This is an important AND VITAL issue not just to Megan Leslie, but to you and your children, and to me and the children I love. I'm sure you would agree that they all deserve a fair chance at a safe, clean, healthy future. Allowing this debate would be a simple nod to the precautionary principle, something that helps ensure intergenerational equity. Surely our children deserve something that simple. You might, perhaps because of your Conservative worldview, be tempted to write off what I have written as hyperbole, but that would belie an ignorance of or refusal to apply risk assessment, whereby risk = probability x magnitude. The magnitude of this emergency is already unprecedented, and the probability continues to grow as we continue to pump out 90 million tons of greenhouse gas emissions every day. I hope, through my seething, that I have managed to remain polite – although somehow "polite" pales in importance compared to ensuring the children a viable future. Also, I must admit that I am getting rather impatient with having to stick up for your children and all the children of this country's Conservative MPs when it comes to the climate change emergency we're facing -- nay, already experiencing. I would be happy to meet with you to explain the emergency further, if that would be helpful to you. I was never much interested in Greek mythology and didn't study it in school. 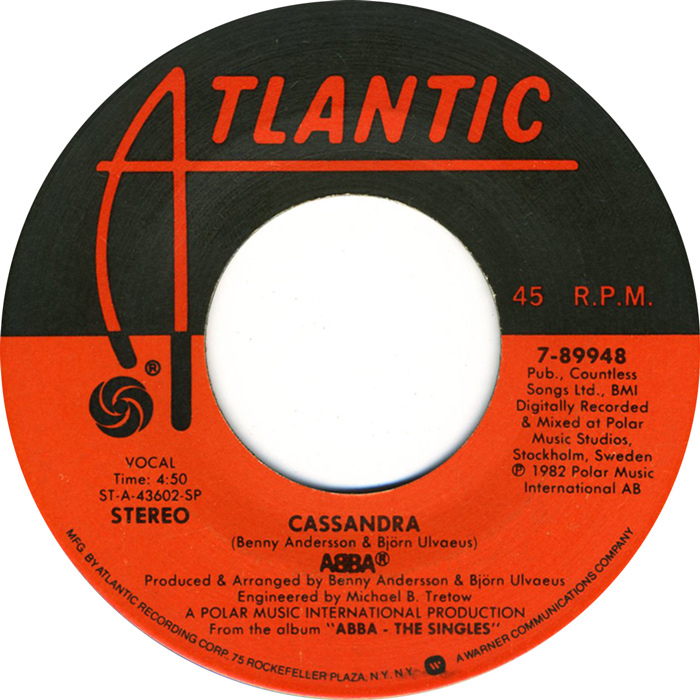 In fact, I knew nothing about Cassandra until people starting calling me by that name. Suddenly Cassandra became a theme in my writings about climate change. Today I want to say that it feels like the Cassandras of the world are starting to be heard — and believed. Which means, of course, that the deniers and Big Money and Big Oil are becoming more and more desperate and underhanded. But it also means that the Cassandras of the world aren't as lonely. 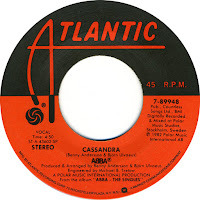 My husband stumbled upon this prescient ABBA song yesterday (video below). It's from 1982 and was the B-side (only oldsters will understand that reference!) to their song The Day Before You Came. "Pity, Cassandra, that no one believed you ... Some of us wanted but none of us would listen to words of warning." To be clear, I'm not saying that I have Cassandra's gift (or curse) of prescience or clairvoyance. I merely make and take the time to keep up to date on the climate change science and then look around the world to see what's already happening. And I understand that what's befalling others will soon enough befall us. Then I make and take the time to write and teach about what I've learned. That's when I get called Cassandra. Enjoy this blast from the past, even if the message is a sad one. And hey, invite a Cassandra out for a tea or coffee this week! Climate change has stripped me of all my sentimentality. And if you've known me since I was young, then you know how much of me that is. Oh, what am I trying to express today? 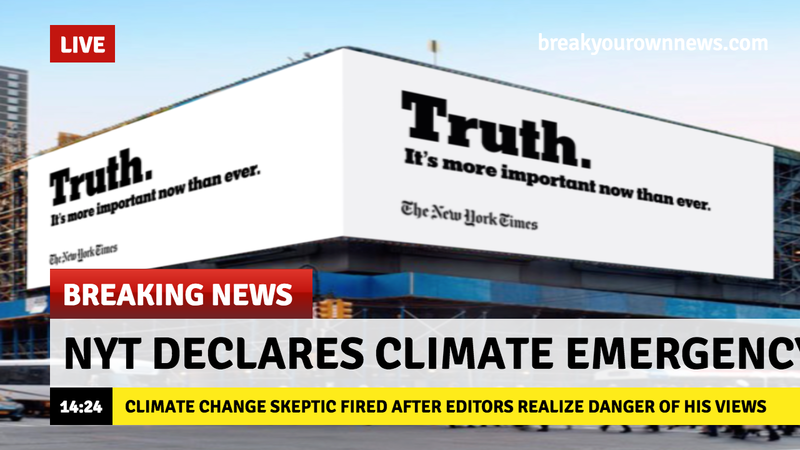 I think it's that I'm finding it more and more exhausting and depressing to, on the one hand, recognize that the climate change emergency fight is pretty much lost already due to global apathy, while on the other hand still wanting to punch through that fatigue and depression to deal with the likes of T**** and the denier NGOs — and now The New York Times, as well? Yes, I'm going to weigh in, briefly, on the NYT's hiring of an opinion columnist whose views diverge, shall we say, from the laws of physics. 1. Buddy, only you would call 0.85ºC, or about 1.5ºF of warming of the Earth (it's not "earth") since 1880 (most of it quite recently) "modest." That modest warming unleashed natural disasters that killed hundreds of thousands, if not millions, of people. And now that "modest warming" is up to 1.38ºC (March 2017), and all indicators are on the rise. This is observation, not projection. Which part of "it's happening and you can see it if you only look" don't you grasp? And then you have the gall to say something about "the possible severity of its consequences." How cavalier, inhumane and unfeeling of you. 2. "[O]rdinary citizens also have a right to be skeptical of an overweening scientism. They know — as all environmentalists should — that history is littered with the human wreckage of scientific errors married to political power." No, sir, ordinary, scientifically illiterate citizens do NOT have the right to question the science of climate change. Citizens who read and keep up to date on the research — especially the evidence of what's already happening — have the right to pose questions. But giving people who still think we were invented 6000 years ago the power to weigh in? No. If you need proof of human wreckage, turn on the nightly news — or better yet, a weather channel. And "overweening scientism." What the hell is that, but the sound of a writer who likes his own voice? Please, if you want controversy, why not declare the emergency? That'll get people talking! And give the kids and their future a break. And so, as my husband laments, not only is there no action on declaring this an emergency, but nor is there any sorrow, any sadness, any regret, any apology about what we're losing. There's just people like the NYT's opinion writer and his cleverness, while a whole lot of other people are snoring.